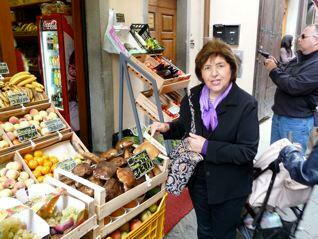 One of the glories of the fall season in Italy is mushroom hunting. It's a tradition that funghi lovers take very seriously. This year a combination of hot weather and lots of rain has led to a bumper crop of the king of mushrooms known as porcini or, "little piglets". Meaty, nutty and woodsy in flavor, Italians will go to astounding, secret lengths to find the brown beauties, even searching woodlands in total darkness so as to keep their “territory” safe from other mushroom hunters. Porcini belong to the Boletus genus of mushrooms and grow in a symbiotic relationship with certain types of trees, especially chestnut, pine, beech and oak. A tell-tale sign in searching for them is to look for small mounds of earth near the base of these trees with dead leaves and pine needles. Porcini can be found worldwide. I have foraged for them in the woods near Cortona as well as in the hills overlooking the Napa Valley of California. But, whether you forage for them or just buy them fresh, the one thing to remember is to cook them right away, otherwise they can become worm infested. Grilling is the best way to cook them. Italians love them with a drizzle of extra virgin olive oil, some parsley and coarse salt. They are also delicious fried or sautéed and used as a sauce for pasta or to top slices of crusty crostini. 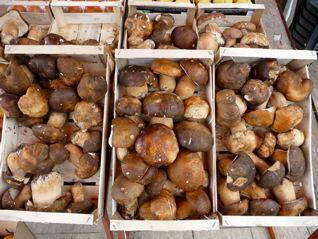 Dried Porcini are popular in the states because they are readily available. They have a much more concentrated flavor than fresh. Buy them from a reputable company, and be sure that you are not buying a bag of stems and bits of mushroom caps. Dried porcini need to be re-hydrated in hot water or broth before using. One of the best uses for them is in risotto, a very welcome dish for fall. Put the porcini in a bowl and pour a cup of boiling water over them. Set aside for 10 minutes. Melt 1/4 cup of the butter in a heavy-duty two-quart sauce pan. Add the shallots and cook them over medium heat until they begin to take on a light brown color. At that point transfer them with a slotted spoon to a dish. Add the rice to the saucepan and stir it over medium heat until it becomes translucent and the rice begins to make a crackling sound. Do not let the rice brown; it should look translucent. Return the onions to the saucepan and add the wine. Stir until the wine has evaporated. Begin adding the broth a ladleful at a time and allow the rice to absorb it while stirring. Drain the mushrooms and reserve the soaking liquid. (Sometimes the liquid needs to be strained again to remove any bits of sediment). Chop the mushrooms and add them to the rice along with the reserved liquid. Stir occasionally to keep rice from sticking. Continue adding broth a ladleful at a time until the rice is creamy, al dente (still firm but cooked through) and has tripled in volume. Turn off the heat and stir in the parsley, remaining butter, half the cheese and season with salt and pepper. Risotto should be free flowing off your spoon, not a congealed ball of rice. Practice makes perfect. Serve hot and pass remaining cheese on the side.